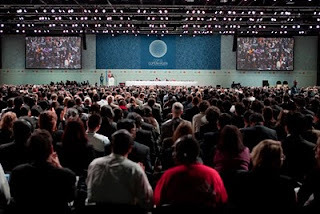 I’m still reeling from the rather anticlimactic finish to the recent Climate Change Conference held in Copenhagen. According to IEET readers, what were the most stimulating stories of 2010? We’re answering that question by posting a countdown of the top 31 articles published this year on our blog (out of more than 600 in all), based on how many total hits each one received - and we’re now down to the Top Three. The following piece was first published here on January 8, 2010, and is the 3rd most viewed of the year. Like so many others, I was hoping for an internationally binding deal that would, at the very least, compel and motivate the nations of the world to address the climate crisis in a meaningful and precedent setting way. But it was not to be. The immediate reasons for the conference’s failure are complex and laden with the political and economic realities of our time (e.g. settling on exact targets and incentives). But these reasons are part of a deeper malaise that is currently paralyzing the countries of our warming planet. As this crisis is revealing, our social and political institutions are ill equipped to deal with a pending catastrophe such as this. 1. Nation-states are far too self-serving: Countries don’t like to be told what to do, and when push comes to shove it’s far too easy for them to hide behind the sovereignty shield. Instead of acting proactively and with leadership, many nations (particularly those in the developed world) are ‘aligning’ themselves with what other countries are doing. No more and no less. And seeing as no one is doing anything….well, there you have it. Compounding this problem is the realization by some countries that they aren’t going to be too negatively impacted by climate change—a disturbing reminder that nation-states are unwilling to deal with threats that are not considered local. 2. Democracies are too ill-equipped and irresolute to deal with pending crises: A reader of mine recently complained that the people of the world were not being consulted on what they feel should be done about climate change. Well, this would only work if the ‘people of the world’ were universally educated about the intricacies of the issues (including scientific, economic, cultural and political considerations) and disarmed of their petty selfishness and local biases. This isn’t going to happen anytime soon, and consulting the Joe the Plumbers of the world on something as multi-faceted and complex as climate change is probably not a good idea. Moreover, like the politicking politicians who supposedly represent them, the masses have shown a tremendous unwillingness to deal with a problem that has yet to show any real tangible negative effects. 3. Isolationist and avaricious China: One thing that the Copenhagen failure revealed is that China’s isolationism is alive and well—even as they emerge as a global superpower. They’re going to go about this whole global warming thing on their own terms, whatever that’s supposed to mean. This unilateral approach is particularly disturbing considering that they’re the largest manufacturing state in the world and house a massive population that will soon start to demand first-world standards of living. And exacerbating all this is the communist Chinese system itself with all its corruption and lack of accountability and due process. 4. The powerful corporatist megastructure: As the onset of last year’s economic crisis so beautifully illustrated, capitalism, if left to its own devices, will eat itself. This is because corporations don’t act rationally or in a way that would indicate foresight or a desire for long-term self-preservation. Moreover, corporations will never voluntarily deal with a seemingly ethereal and controversial problem, especially one that requires a dramatic reduction of profits. 5. Weak consensus on the reason for global warming: Global warming denalists are no longer the problem. What’s of great concern now is the growing legitimacy of anthropogenic climate change denialists—those individuals who believe that global warming is a natural phenomenon. This is a particularly pernicious idea because it absolves humanity from the problem. Adherents of this view contend that human civilization is not responsible for the changes to the Earth’s climate and that as a consequence we don’t need to fix anything—we can keep on spewing carbon into the atmosphere with reckless abandon. This idea is particularly appealing to politicians who use it as a convenient escape hatch. I’m inclined to think that the only way the nations of the world will band together and act decisively on this issue is if an actual climate-instigated disaster happens—one that touches all international stakeholders in a profound way. But even this isn’t guaranteed as there will always be global disparities in terms of impact. Part of the problem right now, aside from the intangibleness of it all, is that some countries will be impacted more than others, a prospect that will ultimately lead to the rise of a new geopolitical stratification: different regions (both inter- and intra-national) will experience the effects of global warming differently, whether it be coastal areas, those dealing with desertification or those having to contend with the exodus of climate refugees. Given the failure of Copenhagen, I’m inclined to believe that semi-annual conferences are not the way to go. Instead, I’d like to see the United Nations assemble an international and permanent emergency session that is parliamentary in nature (i.e. representative and accountable) and dedicated to debating and acting on the problem of anthropogenic climate change (a sub-parliament, if you will). The decisions of this governing board would be binding and impact on all the nations of the world. The chances of outright failure (like the one in Copenhagen) would be significantly lessened. Instead of ad hoc conferences, the emergency sub-parliament would conduct a series of ongoing debates over proposed legislation that would ultimately result in internationally binding agreements. The current climate problem has caused the emergence of another crisis, namely a crisis-of-resolution. Failure at this point is not good enough. What’s required is something more respective of the dire situation we’re in. Next entry: Will Decreasing Scarcity Allow us to Approach an Optimal Meta-Society?